SmartShanghai has received many reports from users who have rented apartments and been cheated, scammed, and lost their deposits or rental fees. You can read some real world, first person accounts of people getting scammed in our Housing Scams and Nightmares article. We do not check apartments listed here. Just because it's listed on SmartShanghai doesn't mean it's safe to rent the place. Never bank transfer any money to the landlord of an apartment or the tenant you are taking the place from, unless you've seen the apartment, met the landlord and have the keys in your hand (and they work). We've have received many reports of landlords who asked for prospective tenants to transfer money to their bank accounts, promising to send over the keys by courier services. But the keys have then never arrived (the so called "Key-Scam"). We highly recommend you do not rent a shared apartment from local Chinese agencies or individuals, unless they live at this apartment themselves. While there are some individuals renting out shared apartments to foreigners as a legit and honest business, the majority of reports we receive about users getting cheated are from locals who claim to be private individuals renting out their apartments but who turn out to be working for agencies. First rule: Only rent a shared apartment from someone who also lives at that place, but never from an agency. If you contact a user and he/she turns out to be an agent, please use the "Report this listing" button so we can remove them from our site. If any of the information in the listing doesn't match the real apartment shown to you, walk away and report the listing to us. If this happens, the chances are very high that something isn't right. It's also a violation of our listings terms to post fake details or pictures of an apartment. Ask to see the original rental contract of the apartment. Make sure it's the right contract for the actual apartment (check the address). You'll need the contract later anyway for registering with the police. Change the keys after you've moved in. In most cases the agency might still have a key, and we have received a report of people having things stolen from their apartment after they've moved in. Deposit a copy of your new key with a friend in case someone has to open for an emergency while you are away. Be extra careful if someone shows you an empty apartment and says he's just moving in and renting out the other room. We've received many reports from users who put down a deposit and when they come back to move in a few days later the contact person has disappeared and the place is locked. Ask for a copy of the passport or ID card of the person you are dealing with, and write down a short contract about the terms you discussed. In most cases where someone gets cheated the landlord changes previously discussed information, so you need to have everything on paper. English is fine. The local police know that foreigners are an easy target for scammers and - from our experience - they tend to side with you if you can prove your point with a contract or some signed, written document. Make sure the property can be rented for residential purposes. Some properties can only be rented as an office space or other specific types of usages. Your agent may not even be aware of the difference, so ask the landlord directly and have him/her to show you the property license proving that the property can be rented residentially. 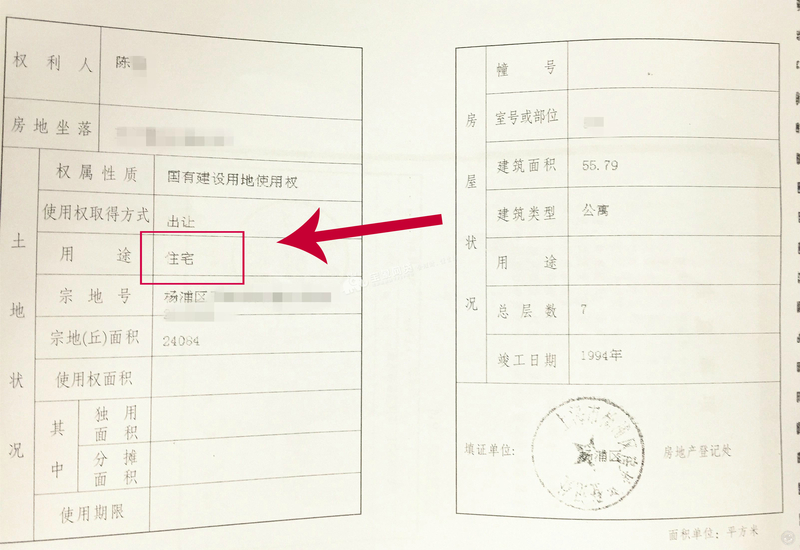 On the license, under usage (用途), it should say residential (住宅). Don't wait until you've paid your deposit and rent, only to find out that you're living there illegally when you try to register your address with the police. Get a written confirmation about anything you've paid for. Ask for a receipt for the deposit and every installment of rent you pay for. We've heard stories where someone paid rent and the landlord denied having received anything two days later. Getting a deposit back when moving out is always difficult, and it's better to have a confirmation about how much deposit you paid when you moved in. The standard deposit for shared apartments is one or two months' rent, but never more. If anyone ever asks for more than that, walk away. Downpayments of several hundred RMB are common if you are not moving in right away, but hold the full deposit back until the moment you move in. A regular payment schedule in Shanghai is monthly or on a two-month cycle. Visit apartments during day-time. Ongoing construction noise can ruin your life and you won't be able to find out if the apartment next door is under construction right now if you visit a place in the evening. Watch out for noise, bad smells (e.g. that tofu-restaurant below the apartment?) and ongoing construction work. Once a building has been constructed, rooms cannot be divided by barriers or walls and rented as two spaces. Don't sign a contract for an apartment that appears to have been modified to make additional smaller rooms. It's illegal to live in them and you may end up in the situation of getting kicked out after paying your deposit and rent. This document represents our best efforts to share tips and things to avoid for renting an apartment or shared apartment in Shanghai, and we hope it is a helpful guide. It is a living document that will evolve as we are presented with new situations, and we'll update it periodically to reflect these changes. Feel free to report it to us if you have had a bad experience with an apartment listed on SmartShanghai. We are trying to make our listings as useful as possible, and we'd like to share bad experiences with other users to help others avoid the same mistakes. SmartShanghai Housing is Shanghai's most popular rental listings platform. We remove any listings that don't meet our strict criteria. However, we are not responsible for disputes with landlords, agencies, other users or the content of their listings.